The evening plans didn’t wait for talks to be done. The IRC channel (#oscon on irc.freenode.net) was alive with talk of prospects for dinner and drinks after the conference. I myself was torn between a group going out for Lebanese and another going to Henry’s, but opted to go with my buddies from home to Henry’s. It was worth it. 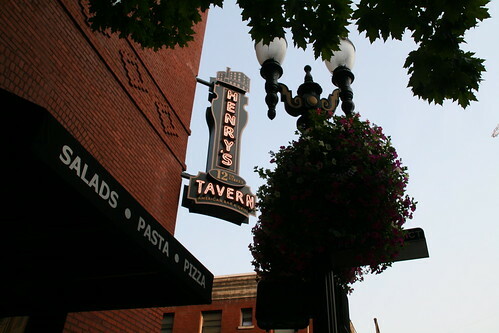 If you haven’t been, Henry’s Tavern boasts 100 beers and hard ciders on tap (oddly, the beer list is the only menu *not* online – guess it changes too frequently). There are a ton of local beers that you can’t even get on the east coast just waiting for you to try, but there are also some rare treats, like the Belgian Lambic beers, which you don’t often see on tap. The food is a little pricey, but is really good, and the staff is very friendly. A couple of us were in a rush to get back by 7 for the BoF sessions, and when we asked the waittress how easy it was to catch a cab, she immediately informed us that she would have the hostess call one for us. About 2 minutes later we were in a cab on our way back (we wouldn’t have made it back in time if we had to walk back to catch the light rail). I was not one of those rushing to a BoF, so I did a little poking around the area near the convention center. It was getting dark, and I didn’t want to stray too far, but I did find a couple of points of interest. First, there’s a bank right across the street from the convention center. I’d be willing to bet that the ATM there is less than the $3 the ATM inside the center charges. Beyond that is a paintball place. It was closed by the time I found it, and I don’t know if they run every day, or anything else, but interested parties might find it open during the lunch breaks or something if you wanted to check it out. 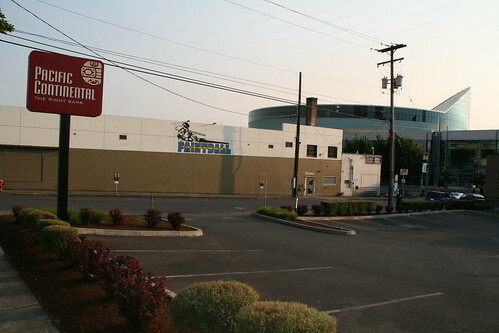 The paintball place is located behind a building that is directly across the street from the conv. center. If you see the bank, it’s on the other side of the side street the bank sits on. Tonight appears to be low-key from what I can tell. There’s currently no chatter on irc, the hotel bar had a few people chatting, and I might go down to catch the rush of people as they return from dinner and BoF sessions. Stay tuned tomorrow for more! Don’t forget, absinthe is now legal in the US and Oregon has only the second US absinthe distillery. Check out Trillium Absinthe if you can get your hands on a bottle. I’m surprised you haven’t mentioned Powell’s Books (http://www.powells.com/). I always stop there when I’m in Portland. They have a separate Technical Books store that is larger than most Borders or B&Ns.